If you’ve looked at a slideshow or presentation on the Kerr Center website in the past few years, chances are it was hosted on the SlideShare site. 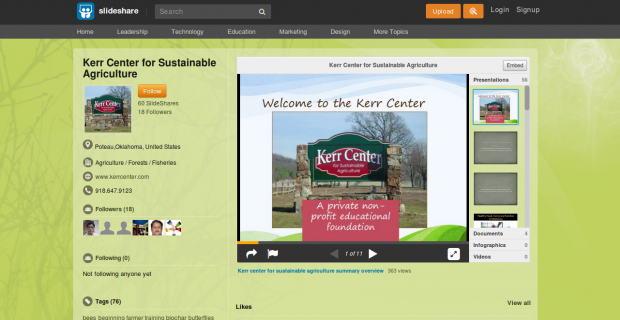 The Kerr Center has over 60 slideshows and presentations posted on SlideShare. Our “Hoop House How-to” series is in the top five percent most-viewed content there, but that’s only the tip of the iceberg. Most presentations from three years of Beginning Farmer & Rancher classes are posted there, along with those from more specialized individual workshops on topics ranging from landscaping for pollinators to biochar to microbial inoculants. Browse our presentations on Slideshare to see what you can learn!